On March 28, 2011, Resorts of Ontario held its annual general meeting and preferred supplier’s tradeshow at Nottawasaga Inn and Resort, located in Alliston, Ontario. Sheila Maxwell of the Briars Resort and Spa was elected as the new president of Resorts of Ontario. Born in Scotland, Sheila grew up in Toronto where she attended York University. During her summers she worked at seasonal resorts in Haliburton and fell in love with the tourism industry. With an educational background from York, Sheila also graduated with honours from Hotel Management at George Brown College. Sheila has worked in the industry for 25 years and is currently the Director of Food and Beverage at the Briars Resorts and Spa. Sheila has served on the Board for Resorts of Ontario for the past 8 years. 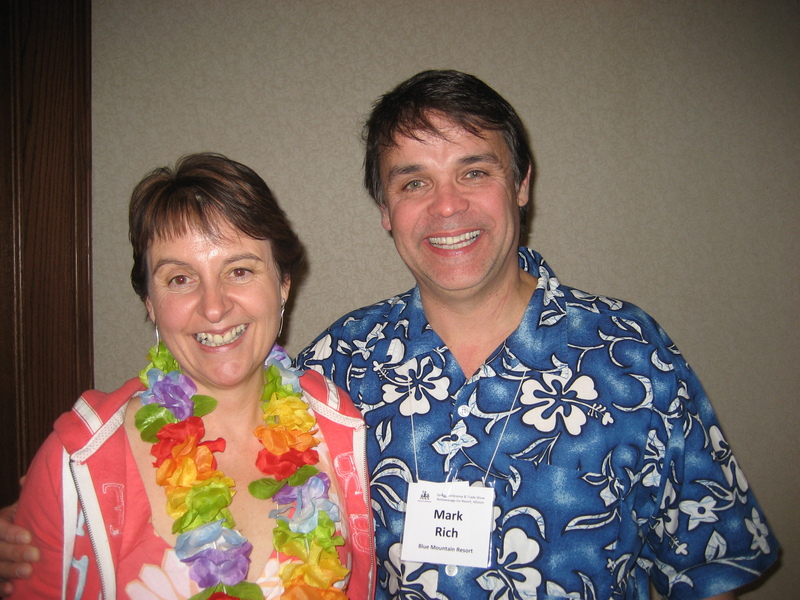 She succeeded Mark Rich – Director of Sales at Blue Mountain Resort who served as president from March 2009 – 2011. As outgoing president Mark will continue to serve the board of directors as chairman of the board. As part of the evenings festivities, Resorts of Ontario also took the time to recognize the dedication and contribution of individuals from the industry who have facilitated the growth and progress of the Association. The George Martin Award which shows outstanding contribution to the growth and success of Resorts of Ontario, was awarded to Anne Marshall of Elmhirst’s Resort. Anne has been involved with the association as a board member for 20 years. Anne is also a past president and represented the industry on the provincial and national level. Her passion, experience, leadership and dedication are greatly appreciated. The second award given was for Outstanding Contribution. The recipient of this award went to Jamie Staring of Raesgo Advertising Graphics. For nearly 20 years, Jamie has made enormous contributions and has played a significant role in portraying our image. He understands the essence of “ resorting in Ontario “ , the culture of Resorts of Ontario, playing a key role in conveying our story in print, electronically, and to our key audiences. Congratulations to Sheila and thank you to Mark, Anne and Jamie for your contributions and dedication to Resorts of Ontario. Monday, September 7, 2009 is Labour Day. Here is a short list of Resorts of Ontario members that are running two- and three-day Labour Day Weekend packages. The prices mentioned here are approximate, so check the links below for specific details. Packages can also be booked online at www.resortsofontario.com. Bayview Wildwood Resort is a great place for kids and families. Bayview Wildwood Resort on Sparrow Lake in Muskoka has a three-night Labour Day special Starting at $384 pp/dbl. Friday, September 4 to Monday, September 7 – two Children stay for free. Their website has lots more information and there is a great photo gallery here. Viamede Resort, “the Grand Lady” of Stoney Lake, has been hosting families and groups in the Kawarthas since Colonel Sam Strickland’s time in 1870! This luxury conference resort and spa is about 30 minutes north of Peterborough, Ontario. I just got off the phone with them… if you book for the three nights over Labour Day, they will give you 15% off the regular rates. Nice people. This is their website. Fern Resort has introduced RSVP rates (Recession Sensitive Vacation Plan). Three nights over Labour Day weekend at Fern for a family of four will run about $1300. Fern Resort is an “American Plan Resort”, which means that all meals, entertainment and most sports and recreation facilities are included in quoted prices. Check the site or give them a call for exact details. Previous blog post on Fern Resort. “The Briars” has been a fixture of the Ontario resorts industry for generations. The Briars Resort & Spa has been at Jackson’s Point on Lake Simcoe for about 165 years! They have a wide variety of inn rooms and housekeeping cottages beside the golf course and along the lake. Check their website for availability. They have both two-night and three-night Labour Day packages starting at about $700 for two adults. Pine Vista Resort in The Kawarthas is one of the great housekeeping resorts.